New cars and motorcycles could no longer require an MOT for the first four years. Proposals unveiled yesterday (Sunday, January 22) by transport minister Andrew Jones would extend the period before the first MOT test is needed from the current three years to four. Jones said: “We have some of the safest roads in the world and MOT tests play an important role in ensuring the standard of vehicles on our roads. The Government is consulting on the plans which will bring England, Scotland and Wales in line with Northern Ireland and many other European countries including France, Ireland, Italy, Spain, Denmark and Norway. In 1967 the MOT-free period was reduced from 10 to three years. Now, safer technology and improved manufacturing means new vehicles stay roadworthy for longer. It is a legal requirement that all vehicles are roadworthy, regardless of whether they have passed an MOT test and the content of the tests will not be changed. 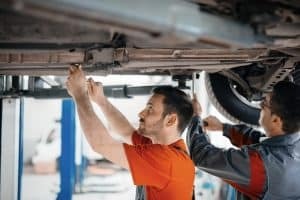 More than 2.2 million cars each year have to undergo their first MOT test and in the past 10 years, the number of three or four-year-old cars involved in accidents where a vehicle defect was a contributory factor has fallen by almost two thirds, from 155 in 2006 to 57 in 2015.